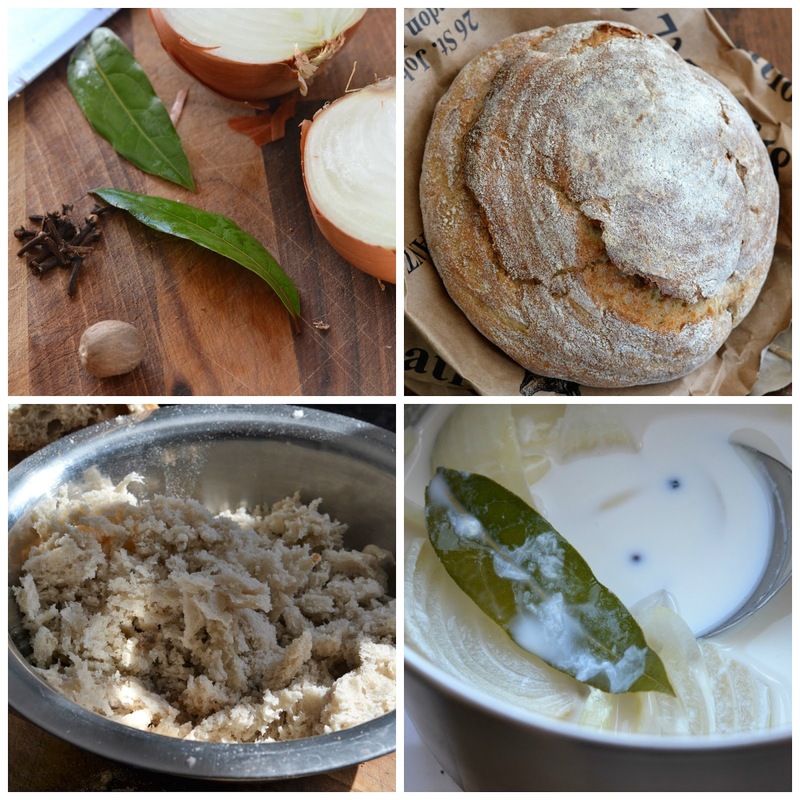 Given that bread has been around for millennia, it probably comes as no surprise that bread sauce, a humble and delicious concoction, has been around for a long time also. It is said that the Egyptians used to make it, to apply as a poultice on bunions and to sooth chicken pox spots. The Burgundian Gauls (or Vandals) of East Germany liked to rub it into their long braids and fashion their hair into spikes before battle. And according to ancient manuscripts kept in York cathedral, the Anglo-Saxons were overjoyed to discover that bread sauce could be used in the building of their rudimentary huts; instead of the usual wattle-and-daub to cover woven twigs. Which of course, was traditionally mixed together with soil, straw and seething, hot animal faeces. However, it wasn't until the Tudor period, with the influx of spices, from along the Silk Road, from the Outta Arabias and Inner Mongolias and across the great Steppes of Euroastrolasia, that bread sauce began to be regarded as a food. Because refrigeration was still in its infancy and indeed, as electricity had yet to be invented, there was often a necessity to cover the foul taste of rotting fowl. In fact, some scholars say that it was Henry the 8th who was responsible for the invention. After loudly proclaiming in royal court, that all he wished for were 'some pretty, sweet ducks to kiss,' he began to fart violently and start to scream for his monks. His poor, beleaguered cook, in a blind panic, stewed some old lumps of bread and onions in milk and using a fist full of cloves and bay leaves, slathered the Kings' ten roasted mallard with this new elixir. But it was too late. By the time it reached the table, Henry was incapacitated by gout, blinded by syphilis and struck down by an exploding ulcer. He died the very next day, without ever knowing bread sauce. Which was a shame but still, recent research has suggested that his courtiers tucked into that dish, regardless of his impending demise. As some notable historians have noted, they clearly didn't give a flying fudge about the King and because it was so damn tasty, they decided from henceforth and onwards hence, that bread sauce should always accompany some sort of roast bird; such as turkey, chicken, goose or swan. Particularly on a Sunday and especially with rich gravy. It was passed down in law and anyone found not complying would soon be branked, whipped or worse. And so, a legendary condiment was born and forced upon the nation. You, of course, should always buy the most freshest and most free ranging and organically minded sort of bird, for your Sunday particulars. But if you do and have some leftover bread, rummaging around in your cupboard, you'd be a fool not to make some of this heartwarming and nourishing porridge to go alongside it. The recipe that follows is actually one of the most earliest recorded and therefore, most original instructions for making bread sauce. Found in that infamous tome of renaissance cuisine - 'A Propre New Booke Of Cokery' - you might find it a bit hard to follow. If you do, you can always refer to Delia's version instead. It's not quite the same but she has been around for a while also and historically, I have always found Delia to be quite reliable. Tayke a loafe of breade and tye with stryng and hang over a well, fir 10 dayes, until it is harde and undigestable. Breake with bear hands, into pyeces and place upon a platter by the grayte. To make a whyte broth, squeze the uddrs of a female cowe and gather one bucket of mylk. Place on the grayte and add a onion, chopd and a baye lefe, from a baye trye and a dozenye cloves from the Easte. Boyle and leeve fir 2 hours, to steepe. Then take out the baye, onion and clove. Fir the sawce, add the pyeces of breade into the milk and stere it well for quaylng on the grate, until thicke. Add creem if so wish and salte and pepper, but only to marke the daye of St Swithins. Serve with swanne and slopps. The Foure Stages of Bread Sawce. This would not have fed Henry the 8th.